We will be open for wine tasting from noon to 5 pm on January 30 and 31. Make plans now to visit the winery, located at 23076 Summit Road in Los Gatos, to taste a selection of our award-winning wines. 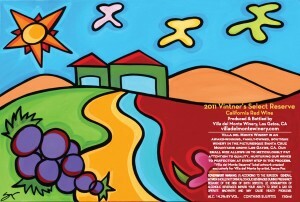 Be sure to taste our first blend, Vintner’s Select. By combining Santa Cruz Mountains Cabernet and Carneros Merlot, we have produced a blend with the fruitiness and softness of Merlot balanced by the structure and intensity of Cabernet. This limited-production wine features a colorful and festive label from local artist Sonya Paz and it won a Silver Medal at the 2016 San Francisco Chronicle Wine Competition.